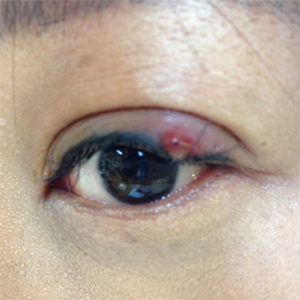 The patient was 38 year old female with severe pus-forming inflammation (furuncle) on the left upper eyelid. No antibiotic during and after the Cosdmodic therapy has been given. x2 points on the finger of both hands, x 1 point on the posterior neck of both left and right, x 2 points on the lower left eyelid, totalling x 8 points were selected for the application of electrode probe. 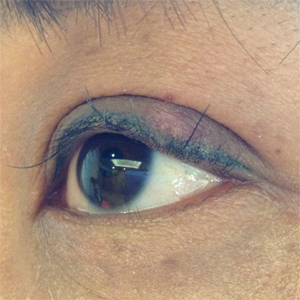 Opposite finger was applied on the lesion of left eye continuously during the application of electrode probe successively on x 8 points. Myoscen, S1 mode was employed. Three sessions were given for three consecutive days, each session lasting less than 10 minutes. No healing reaction was reported. Inflammatory process and pain was controlled after first session, leading to complete healing of the wound after third session.